The intersection was always a challenge, even before they built a free-standing Starbucks. Now, aggressive SUVs, impatient sports cars, and clueless teenagers meld with frantic commuters to make intolerable what was merely irritating. So to get from home to office, I discovered a circuitous route that leads past one edge of Crescent Lake. 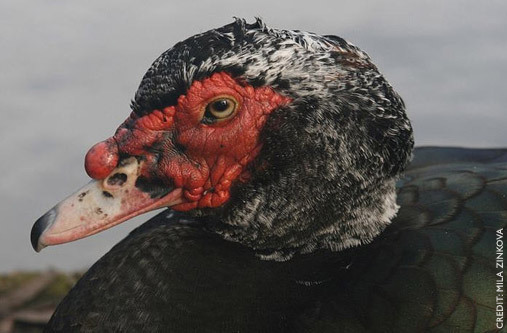 This deviation introduced me to the Muscovy ducks. Not that they are easy to ignore. They stare you down if you dare turn the corner by the puddle where they congregate. If it’s time to cross the road, all traffic should — and does — stop. An adult looks like a genetic experiment between a duck and a chicken gone very wrong. But thanks to Starbucks, I see their babies are as cute as cute gets. The other day, I stopped in hopes of feeding the babies some leftover corn chips. They must have been napping but a herd of garden variety ducks, not to mention a squirrel posse, was more than happy to indulge in junk food I know better than to offer. The chips were nearly gone when a man in tattered clothes approached, riding his bike while waving his arms, muttering and frowning. Indigents who display signs of mental illness are not a unique sight, I’m sorry to say. I tried not to have the stereotypical reaction, forced myself to meet his suspicious, darting eye. This was usually when the appeal for just a little change began. “There’s babies in the lake,” the man called, scowling deeply. Of course, he was quite right. But I wouldn’t know that if it wasn’t for Starbucks.